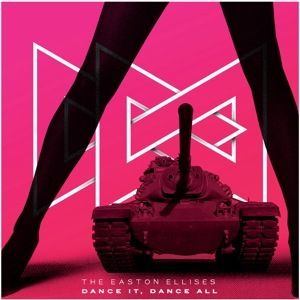 [EN] "Dance it, Dance all" is the 10th Easton Ellises creative commons single. To mark the occasion, the band launched a successful 30 day fan funding (a.k.a. crowd funding) campaign in order to collect the funds necessary to press a vinyl record. A producer pack was put up on the web for artists to remix and submit their own versions of the song. The response was phenomenal and "Dance it, Dance all" remixes were submitted from all over the world. Due to the limited amount of play time available on a vinyl record, only the original version, a Motel Costes Mix and the bands 6 favourite remixes were pressed onto the record and officially released in Montreal, Canada on May 17th 2012. Included in this "Dance it, Dance all" release are the 12 cuts that the band really wanted to press on the record. [PT] "Dance it, Dance all" é o décimo single editado pelos The Easton Ellises sob licença creative commons. Para marcar a ocasião, a banda lançou com sucesso uma campanha de angariação de fundos para imprimir um disco em vinil. Um pack de produtor foi disponibilizado online para artistas remisturarem e submeterem as suas versões, a resposta foi fenomenal com remisturas oriundas dos quatro cantos do mundo. Devido ao limite do vinil somente 6 remisturas acompanharam o single em vinil, lançado oficialmente em Montreal, Canada no dia 17 de Maio de 2012. Incluidas nesta edição online do "Dance it, Dance all" encontram-se as 12 faixas que a banda queria realmente imprimir.